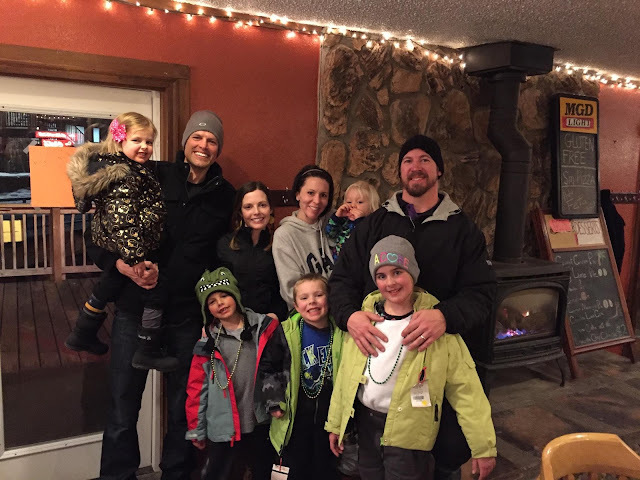 His Building Blocks: Our Ski Vacation! 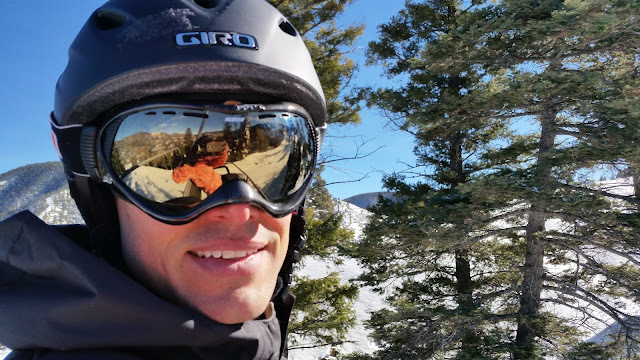 Drew and I said 3.5 years ago when I began cancer treatment that when it was all finished, we would go on a ski vacation in celebration of its completion. It has been over 2.5 years since I finished treatment and we finally got to go on that vacation. We decided last year that 2016 would be the year we would be taking a vacation! We also decided that the closest ski resort would be in New Mexico, which would be best for the drive with two small children. When our friends mentioned planning a ski trip to Red River, NM in January, we thought, "how fun would it be to go too?" So, we have been planning this ski trip with them since September 2015. It takes a lot of work to acquire all the necessary layers and equipment for the kiddos for skiing when you are trying to buy everything used in Central Texas. But, over the past 4 months I was able to do so. And last week, it was time to go on our vacation! The drive there was really pretty. 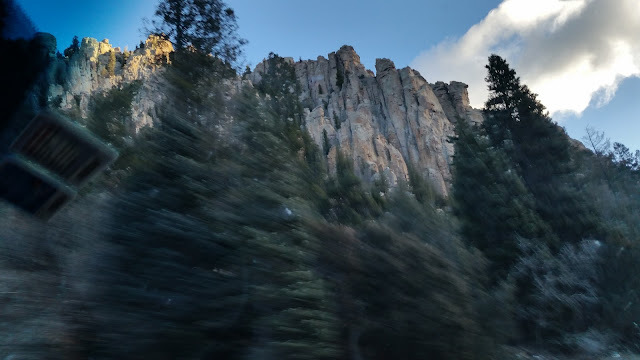 The scenery was pretty diverse once we got into the mountains. The kids were so excited to see snow! 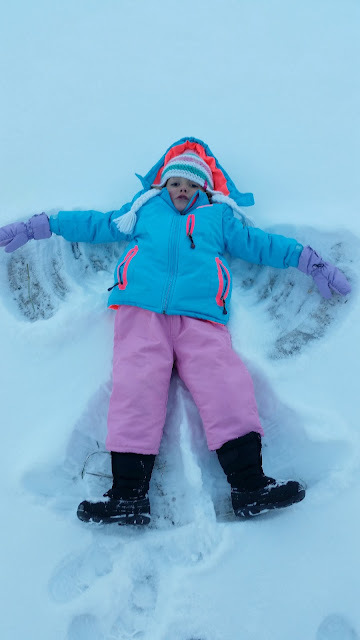 Abbey was excited to make a snow angel. 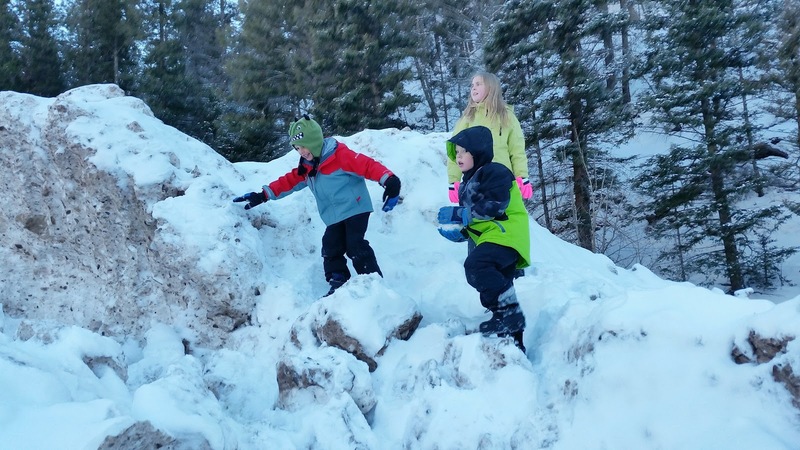 Luke and his friends climbed on huge formations made from the snow that was plowed in a parking lot. Luke and daddy even made a little snowman. He was so proud of his snowman and checked on him each morning to make sure he was still there. 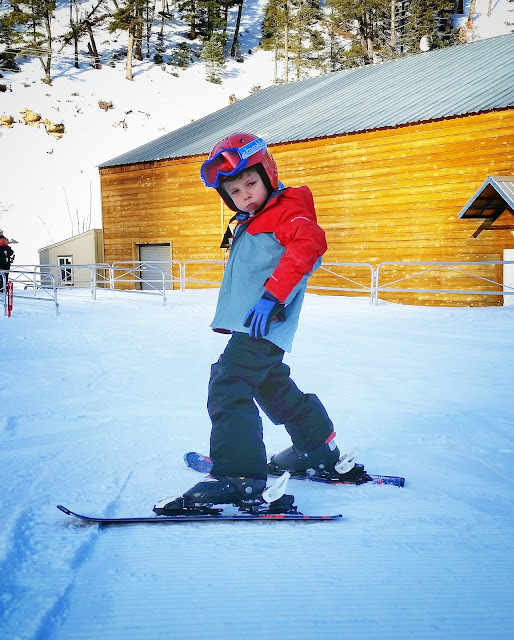 We put the kids in ski school for 2 full days (from 9:30-11:30 and from 1-3p each day). So, Drew and I were able to snowboard together while they were in ski school in the morning and the afternoon. The kids had a great first day in ski school. After we picked them up, we decided to go snow tubing with our friends. Our group (minus Drew who took the picture). Drew and I had a blast snow tubing. I was surprised that both of our kids were pretty scared of this though. The tubes went pretty fast. And, it didn't help that as Abbey and I were exiting our tube at the end of the hill, an adult man came flying down beyond the point were he was supposed to be slowed down and crashed right into Abbey, knocking her off her feet and into the air. I was carrying our tube. It terrified me. Thankfully, someone helped catch her a bit or it could have been a much worse injury. She was ok, but we decided to quit before our hour of tubing was up. It was a busy first day. By day 2, Luke was going down the big green hill and was going up his first real chair lift. 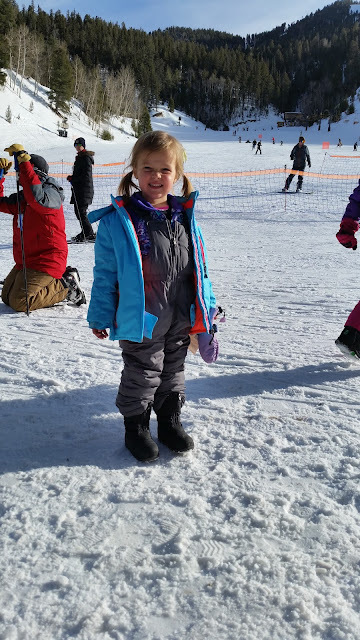 Abbey was tired after her second day of ski school. On the second day, we arrived about 20 minutes early to pick up the kids from ski school. 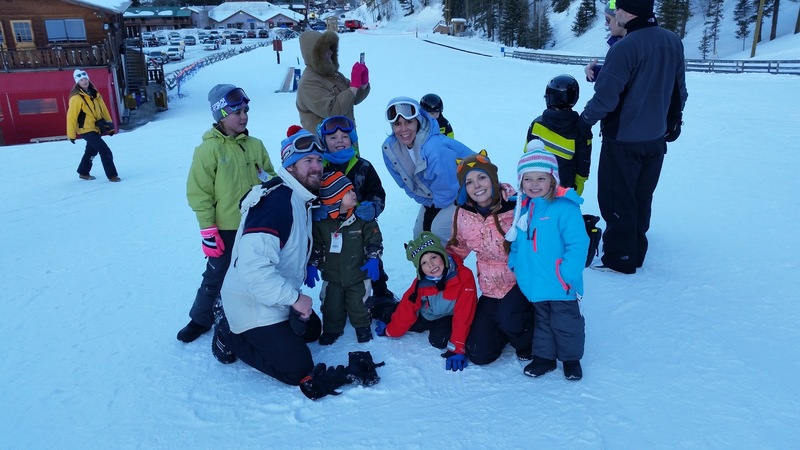 We didn't see Abbey on the slopes, but we did get to watch Luke come off the lift and ski down with his little group. When I picked up Abbey from ski school, she told me all about what she told her teacher. She told her teacher all about Bella, her robot puppy. She said, "I told him that when you rub her back she barks and when you pat her head she wags her tail. I also told him about robot kitty and rainbow puppy that I left at grandma and grandpas. I also told him about our bunk beds at our hotel room." She told me much more stuff that she told coach Andy. I thought to myself, "I bet coach Andy is as tired as Abbey is right now,"-Ha! 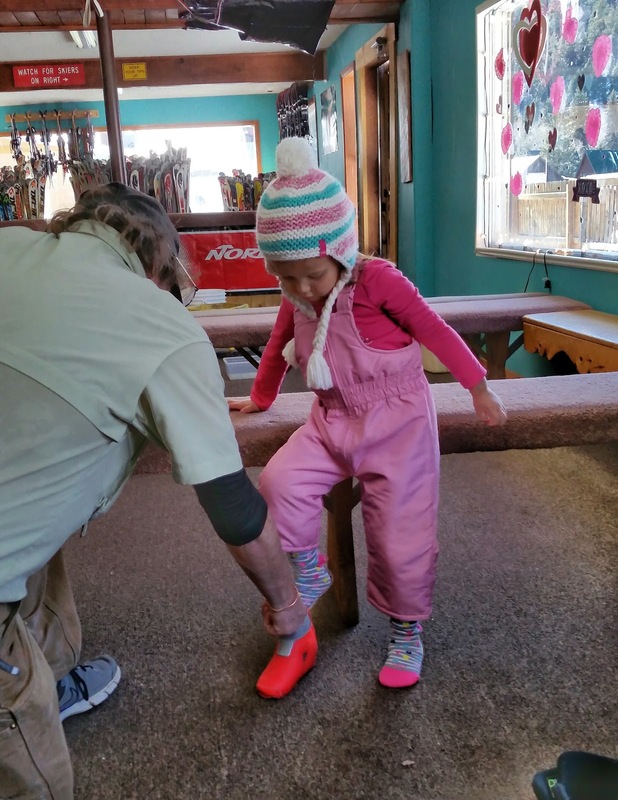 Our friends' daughter, Ava also told us that she saw coach Andy carrying Abbey inside to the ski school building (and she said Abbey wasn't wearing any ski boots). So, I am not sure how much ski instruction she got that 2nd day afternoon. When I picked her up, she also had a hot chocolate mustache. So, I am pretty sure that she worked the coaches over with her charm and managed to get herself some hot chocolate. By the end of day 2, Abbey had learned two new vocabulary words. First, before dinner I had asked the kids if they were enjoying their vacation so far. Abbey quickly replied, "What is Vacation?" That is when I realized that Abbey has never actually been on a vacation. So, I explained what the term means. Later, before bed, Abbey came over to me and told me that her legs hurt. I said, "Abbey your leg muscles are probably sore from all the skiing." She said, "mommy, what does sore mean?" Ha! Our little Abbey hasn't really ever done anything requiring lots of endurance. She doesn't yet ride a bike or scooter, nor does she love to run. She just really has no desire to do these things yet. But, I have a feeling that skiing will help her turn the corner as far as those things are concerned. By the third day, Luke was ready to take turns going with Drew and I down the blue hills. Drew also accidentally took him down a black run....oops. About halfway down that run though Luke decided to slide down on his bottom. He told me, "I thought that was a better idea." Ha! Abbey did well too and she even did one run down the big green hill, after going on her first real chair lift. I was sore in many places due to a few bad falls. It is very different snowboarding as a mom vs. snowboarding before kids. I was much more fearless and carefree back then. I noticed this time (it has been 7-8 years since the last time I snowboarded), I was much more cautious--almost to a fault. I was overthinking things and went much slower than I did before. 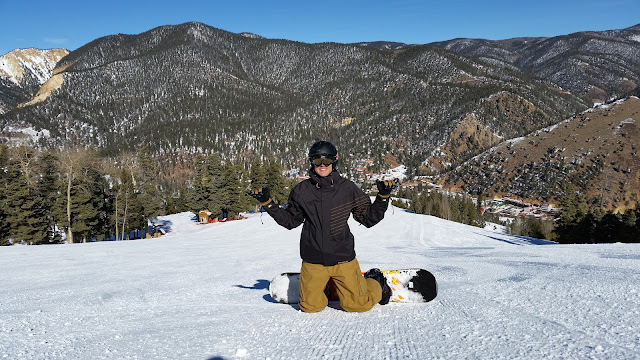 I think the last time I went snowboarding (about 7.5 years ago) I was flying down the hills and I didn't even fall once. I had no use for a helmet and didn't like the way it looked. This time, I could care less about how I looked--I just wanted to protect my body as much as possible. So, I rented a helmet. It's funny the things that happen to your brain when you become a mommy. I have other little people who need me now. Also, I figured my bones were probably way more brittle due to chemo and radiation, so I had a lot more fear of falling this time around. It was a good reminder though that fear can sometimes be crippling. Any time I felt myself having great fear, I fell down. That is how I ended up having a few bad falls. It was fun going on the trip with friends. 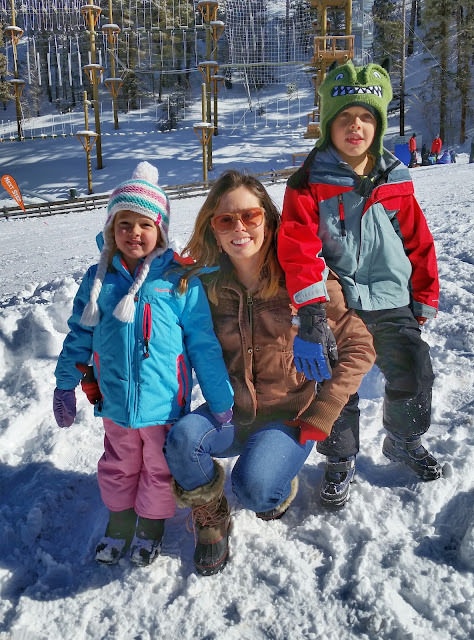 It was neat to let the kids experience the snow and learning to ski together. We got to do some ski runs with our friends. And, we were able to share a couple of meals together. 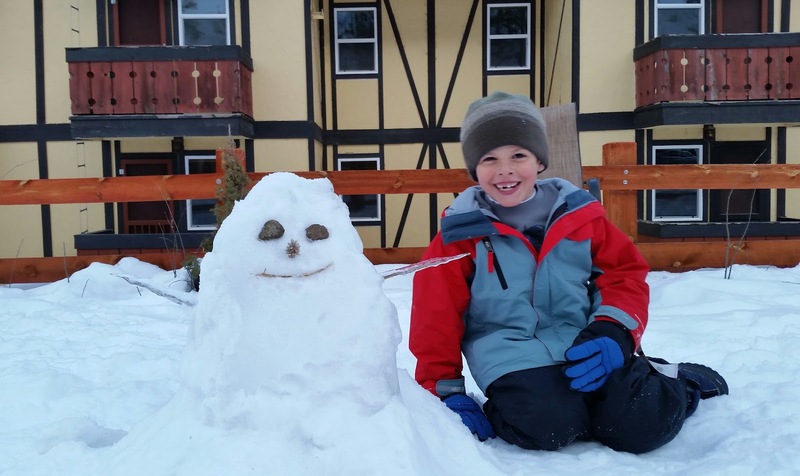 Luke and his friend Brayden progressed at the same pace through ski school. 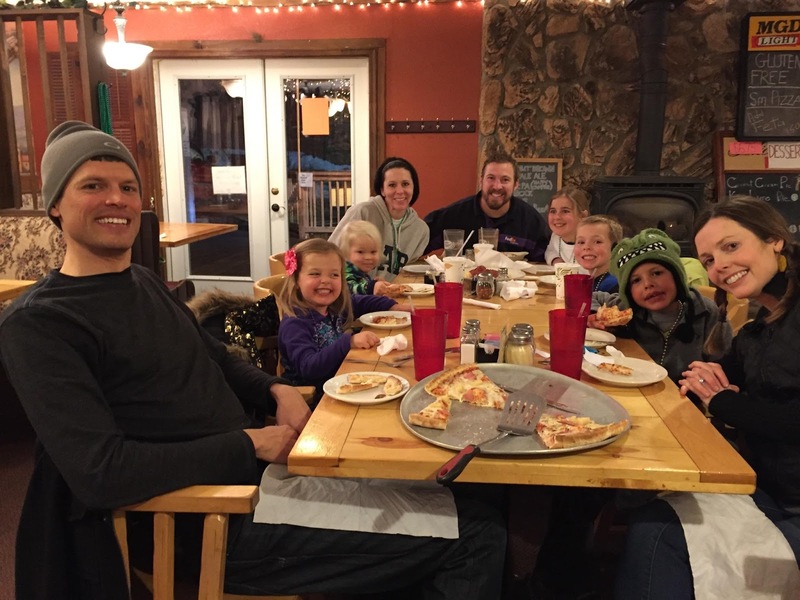 Thus, they were in the same small group together the entire time at ski school. What a fun vacation! The night before we headed back home. We had such a fun trip together. Our room was nice too, and we especially liked that the kids had bunk beds in a separate room. We also had a full kitchen, so we made use of it for lunch every day and we even cooked dinner there one night.